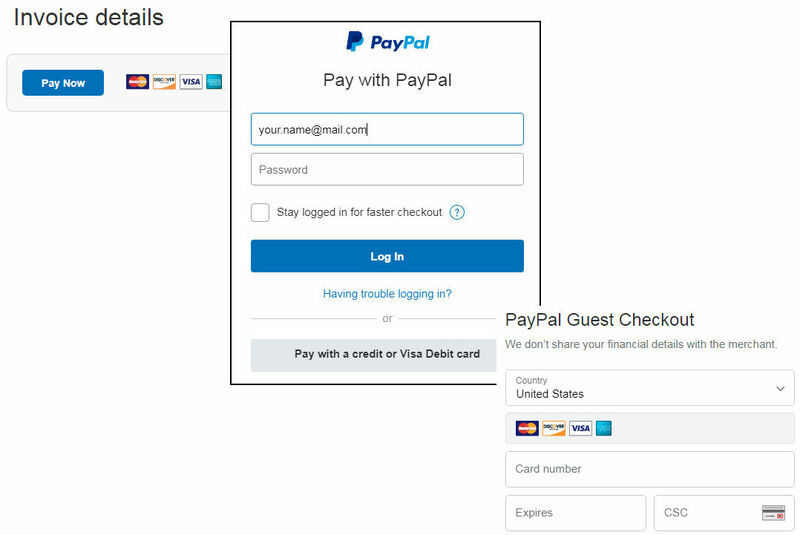 This item is located in the USA (see shipping notes below). 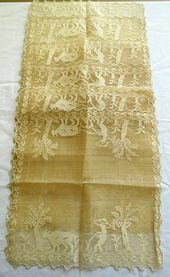 This is a sheer vintage Pina fiber cloth 13 piece table set with a table runner, placemats & napkins. 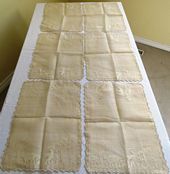 There is 1 Vintage Pina table runner, 6 vintage Pina placemats and 6 vintage Pina napkins. Vintage Pina Table Runner Measurement: 45 1/2" x 13"
Vintage Pina Placemat Measurement: 17 1/4" x 13"
Vintage Napkins Measurement: 13" x 13"
The scene is a farmer plowing his field using an ox and plow and tropical palm trees. This set was likely make for the tourist trade. The vintage set was likely made in the Philippines from pineapple fiber leaves. Pi�a cloth is made in the Philippines out of the leaves of a variety of pineapple plants. The fibers are scraped off the leaf, washed, tied together, spun, & woven. The whole process in creating just the cloth is very long and laborious. Pi�a cloth was never a major export item for the Philippines, but items were carried to Europe and the Americas as gifts and souvenirs. 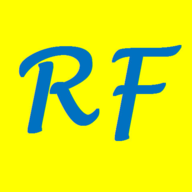 Color: Yellow (I have darkened some of the photos to better show the color). The edges of the table runner, placemats and coasters are lightly scalloped all around. Condition: Overall, the table set is in very good pre-owned condition with some imperfections. The table runner has approx. 40 tiny pin dot holes in the table runner. These extremely tiny pin dot holes are not noticeable until I was closely examining the table runner cloth. I have taken some photos to show this. I did not want to exclude the runner from the listing as it completes the set. With care the table runner is lovely and should be useful to the buyer. A pale light stain on one of the napkins and a pale light stain on one of the placemats. This handmade vintage table set is perfect for a tropical table setting. This item is located in the USA and will be shipped via USPS. Your shipment will be taken to the post office after payment is received, often the next business day.